Here's a color mixing guide for watercolor, acrylic and oil painting techniques. Have you seen the "primary color"-scheme (red, yellow and dark blue)? They're a good start - but with two more colors you can do a lot more, like mixing vribrant greens and purples. With this color mixing guide of five colors (seven, when you include black and white), you can mix every possible hue. Check here more color theory. With the following five colors (seven when you add black and white), you can mix every possible hue. Scroll down for examples, to see what colors will mix other pure and strong colors - all prismatic colors - rainbow or light colors. If you make other combinations, you'll get more shaded tones - brownish and greyish shades. Together with black and white, you can mix all other colors with these five hues. In this list the blues and reds are split in a 'warm' and a 'cold' blue and red. Alizarine and Ultramarine, the cold red and warm blue, wil mix great purples and violets. The warm red, with yellow, will make pure oranges and golden yellow. Yellow and the cold and 'turquoise' Prussian blue wil mix strong, pure greens. Alizarine carmine, mixed with white, will make an almost pure magenta (chemical pink). Scroll down for a ready-to-order list of paint color names. Here's how you mix all other prismatic hues. Prismatic colors are pure, strong rainbow-colors with no 'smudge' in them. These are graphic examples, made with web-safe colors to guarantee the best color depiction. Some deviation may still occur (depending on your screen age etc). If, in real life, your color is too dark, add a little white (it will stay pure). Ultramarine with a little prussian blue give a cobalt blue, like the sky on a clear day. You'll need to add a little white, and Prussian will become turquoise when mixed with white. Ultramarine and Alizarine Crimson give a range of blue-violets, violets and purples, and may also need a little white. Yellow and Ultramarine will produce more of a dull leaf-green. Experiment with them, at first only two at a time, and see what comes out. After that, add a third color to see what greens, browns and greys you can make. This will help you a lot in learning how to paint. Also check this page on basic color theory. Use a palette knife (or a kitchen knife) for stirring, it saves paint. These are the paint color names of the above color mixing guide, in Blick Oil Colors . Blick is a big online supplier of professional art materials. They offer good quality, and a big company like that can offer good prices. They have two oil paint house brands: Blick Oil Colors is a cheaper student-grade linseed-oil paint, and Blick Artists' Oil Color is a safflower-oil artist-grade paint. Linseed oil actually is better for adherence, only it yellows sometimes and safflower oil doesn't. Yellowed linseed-oil paint goes clear again when put in the daylight. Blick also has other known brands of professional oil paint (Winsor and Newton, Rembrandt and Old Holland). Click here for the paint color names of Rembrandt and Winsor & Newton, and here for info on different oil paint brands, with extra tips on mixing, and an economy-quality list of oil painting colors. Oil paint is only a raw ingredient, and general info (and painting habits) are usually not that reliable. Everyone uses acrylic gesso as a primer, but in house painting, we all know it's not a good idea to put oils over acrylic paint. 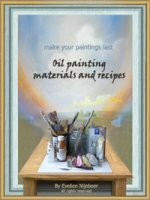 In this oil painting guide you'll find recipes and info, on both modern and classical painting supplies, that will help you make your oil paintings become time-resistent. Most color names are the same in other brands, but be careful with turquoise (it's often too dark) and carmine - in acrylic paint, it's usually too light. The funny thing is: if you mix these colors, they go black(ish) - but if you put them side by side, they make each other's color come out. When a brown (toned down orange) and a toned down blue are put side by side, their "orangeness" and "blueness" come out - they start to flirt. When you put prismatic and contrasting colors side by side, they'll do a scream contest. But if you mix them, they turn into a dirty brownish grey. Click here for more on contrast. Each of these combinations will have its own mood. For portraits, it's best to have alizarine crimson for reds, and for luscious green, it's best to take prussian blue. For dreamy night scenes, use alizarine crimson and ultramarine. For yellow, take a cold yellow (cadmium or azo yellow light). It makes good greens, and can be warmed with either of the reds. A limited palette helps to create a unified basis. If you take your time to mix them carefully, you'll still have a big range of colors. If you like pure colors in all color groups though, it's best to use the color mixing guide above. Once you figured out the basics of the above color mixing guide, it's good to start working with these earth colors - one by one. The colors from the color mixing guide are prismatic colors - really, they are light colors, like rainbow colors. Earth colors are like their earthly appearance. Earth colors are made of earth, they're types of ready found (raw or burned) clay. They can give the prismatic rainbow-colors a good basis, and you can use them to make your basic colors more shaded and natural (good trick: using one earth tone to tone down all your colors - they'll harmonize much better). The basic color list mentioned in the color mixing guide above is necessary for learning how paint colors mix. But after that, it's good to use earth colors for imprimature and underpainting, and add the brighter colors later (especially if you like a natural, realistic painting style). You can mix browns yourself too if you want to: click here to see what colors make brown. But buying them is easier. This list of earth colors is a basic one - there are more kinds available, but these colors all have a very specific function in classical oil painting techniques. The color names in the list above guarantee the right shade, as long as you don't buy tubes of paint with "hue" added to their name. Click here for more info on colors for oil painting - with info on brands, pigments and an economy-quality pick. Besides the lightness, the most important difference between the different browns is their color temperature. Burnt siena is the warmest brown, it's almost red. Raw umber is a cool brown, leaning towards green. Burnt umber is the darkest one, and also relatively warm. Caput mort is also cooler, but more towards magenta (instead of green). And yellow ochre is a warm color too. The basic color mixing guide list, plus the earth colors, will cover most of your needs. But there are additional colors with a great use, that you can add for practical or sentimental reasons. Cadmium yellow and red have a certain coldness and a very strong hide - for a transparant yellow or orange you need to add painting medium or get another color (my favorite: gold lake from Old Holland Paints). Dioxazine Violet is great for combining with oranges and warm yellow - a magenta interval color is formed relatively easy. Viridian green is a unique, very transparant blueish green - the only kind of green you can't really get by mixing. It's the most immaterial green available - I couldn't do without it. Indigo is a very dark night-blue. Technically, you can mix it by putting ultramarine and black together. But it's nice having it ready made. Some colors seem to be designed to represent a very specific mood or character. Permanent red, viridian green or ultramarine blue represent color effects that are truly an enrichment to the range of natural pigments that were available before. A little basic color theory can help understand more about these effects. This wil help you to create you own artistic set of painting techniques. If you know, by heart, why you apply a color, your painting will be more authentic and convincing. Viridian green - a very transparant, pure, cold, strong and utterly immaterial bluish green. Like menthol. You can't mix it. Green earth - everything you paint in green earth and white becomes like an immaterial dream or memory. But the immaterialness is different from viridian green: green earth is like a dream in the past, and viridian green is very much "here and now". chromium oxyde green, a good base-color for foliage. Viridian green is great for mixing a wide range of greens and turquoise. If you mix it with yellow, you get the strongest lime-green, if you mix viridian green with cyan or phtalo blue, you get turquoise, and mixed with any earth color, you get all kinds of shades of natural foliage-green. And viridian with indigo (dark blue) or violet becomes a highly interesting and scary dark petrol green. Some of the product links on this website are so-called affiliate links. It means that, when someone buys something via this link, the creator of this website gets a little commission.